On Friday, June 2, WHSAD students presented the final plans for the architecture studio redesign project. Earlier this year, WHSAD was awarded capital funding from the office of Brooklyn Borough President Eric Adams and Council-member Stephen Levin. The funds will be used to modernize two classrooms into state of the art architecture studios. 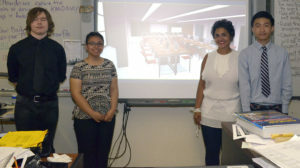 Celeste Ortiz, Anamaria Jovel, Joseph Lo (past intern at the Office of Topography at Borough Hall) , and Patryk Pozarlik presented the plans for redesigned studios to Deputy Brooklyn Borough President Diana Reyna. Groups of students at WHSAD were tasked with redesigning the studios to meet the criteria set up by the teachers and industry partners. The WHSAD school community thanks Deputy Borough President Reyna for her continued support in pushing forward the school mission, which is to provide students with workplace/project-based experiences prior to graduation. All work and designs were done by students using Auto Cad and Rino. Construction is expected to be completed during the 2017-2018 school year.